The Liv-ex Italy 100 has been the worst performing index of the year so far, losing 0.85% as the wider fine wine market continues to post gains. Paradoxically, Italy’s monthly share of trade on the platform has risen from 6.4% in 2017 to 7.9%. But it is a slowdown among Super Tuscan trade that is causing most of the problems, as they account for half of the 10 wine labels in the Italy 100. 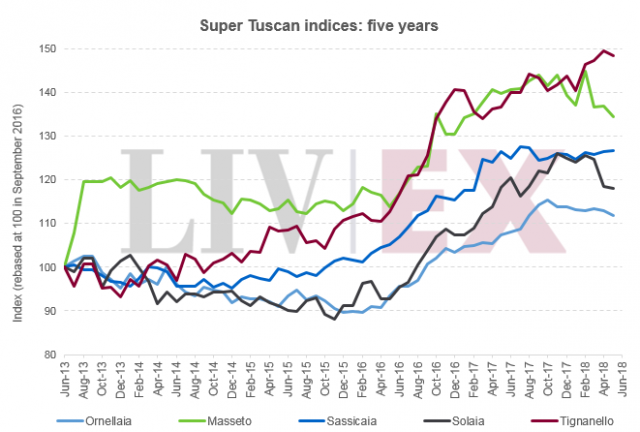 As Liv-ex noted, Sassicaia and Tignanello have made gains of 2.8% and 1.1% this year but Ornellaia, Masseto and Solaia have declined 2.7%, 3.5% and 6.4% respectively and losses for some individual vintages have been “stark”. For example, the 2005 vintage from Masseto and Solaia, despite low market liquidity, have both fallen over 20% in price since the beginning of the year. Meanwhile, the price performance of several top Barolos hasn’t quite caught up to level the Super Tuscans were at hence the overall dip for the Italian wine sector in the secondary market. On the other hand, as Liv-ex continued, prior to this the performance of the Super Tuscans was such there was a school of thought they would breakaway entirely from other Italian fine wines. Yet the recent cooling around Super Tuscan prices has at least delayed this possibility and the slow but steady performance from the various Barolo producers has brought the wines of the index broadly back in line with each other. The Barolos from Giacomo Conterno, for example, have risen 1.8% so far this year, putting the label behind only Sassicaia in terms of price performance.